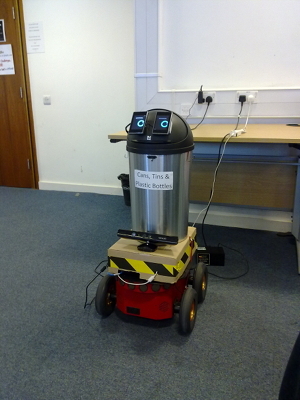 A robot aiming to improve the recycling rate, tested at Imperial College London. 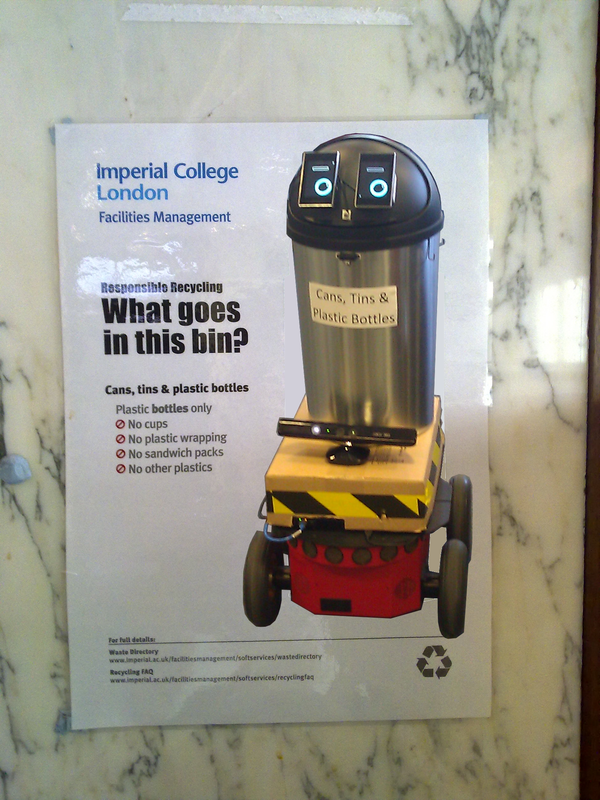 ROBERt, the Recycling-Of-Bottles Encouragement Robot, is the product of our Human Centred Robotics project at Imperial College, officially titled “an investigation into using an encouraging, likeable robotic bin agent to increase participation in recycling”. In other words, we wanted to see, whether we could use a “cute” robot to encourage people to recycle products, that they would otherwise throw into landfill waste. Therefore, we developed ROBERt. ROBERt needed to be easily identifiable as a bin, so his body consists of a rubbish bin, that we modified so that it can open and close the lid (its “mouth”). We also fitted eyes (cheap screens) and a infra-red (IR) distance sensor to the body, and put a Microsoft XBox Kinect for tracking people in front of it. The whole system sits on top of a cardboard box (that hides away the computing power), which was mounted on top of a Pioneer-3AT research robot. And below is ROBERt charging, almost ready for action!